Going Places (Doing Stuff) — you get on a bus, you don’t know where you’re going, and then something happens. Flux Factory invites artists to lead a bus-full of people on an adventure around the greater New York (or even Tri-State area) carte blanche. The content of the tours is entirely up to you, though the itinerary is kept secret from participants. Tours can range from a single afternoon to three days, and will take place from late June through August. Each touree is given only the following information: artist, title, duration, and a list of needed supplies. In other words, when someone signs up for a tour, they know what to bring and how long they will be gone, but they will have no idea where they are actually going or what they will experience. All tours will be first-come first-serve. There is always mystery in traveling, even if you know where you are headed. 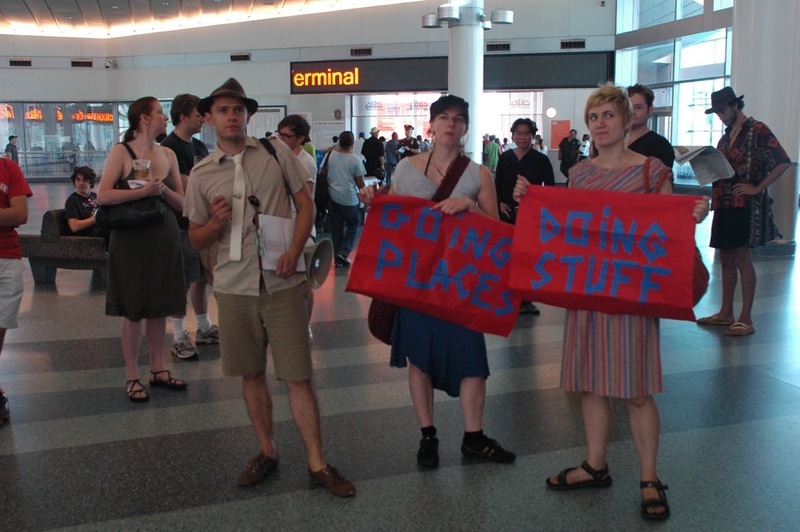 Going Places (Doing Stuff) is all about this mystery, asking the general public to give themselves over to our artists. The excitement of simply stepping on a bus to who-knows-where becomes a metaphor and catalyst for the leap of faith inherent to aesthetic experience in general. The deadline is Monday, April 26th, 2010. The call for proposals is closed! E-Flux Read the original here. Spotlightness is a pop-up group show organized by Sébastien Maloberti at Flux Factory.